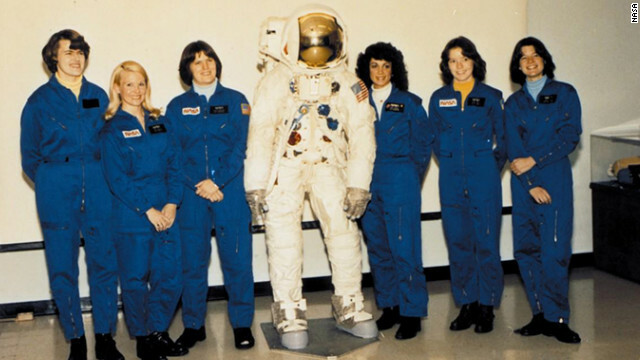 Sally Ride, far right, poses with NASA's first class of female astronauts in August 1979, including Kathy Sullivan, third from left. Editor's note: Kathryn Sullivan, former astronaut and the first American woman to walk in space, is assistant secretary of commerce for environmental observation and prediction and deputy administrator for the National Oceanic and Atmospheric Administration. She is also serving as NOAA's acting chief scientist. (CNN) - Retrospectives of Sally Ride's life over the next few days are likely to include the words "ground-breaking," "trailblazer," "inspiration" and "mentor." And rightly so. She epitomized these words and so many more. To me, she was also a classmate, a crewmate, a collaborator and a friend. Sally and I first crossed paths in the first grade at Hayvenhurst Elementary School in California in 1958, though neither of us remembered the other clearly. We had a good laugh as we pieced this together 20 years later, when we met as two of the first six women in NASA's astronaut corps. It wasn't the only similarity in our backgrounds. We shared a love for competitive sports, and our college careers revealed that we both loved arts and letters as much as the sciences. The second point paid many dividends later on, in great crossword challenges during crew quarantine and many shared lecture engagements. We six women in the Class of 1978 ranged in age from 39 (Shannon Lucid) to 26 (Sally and me). Underneath our different professional backgrounds and personal styles, we had many points in common: All six were intelligent, goal-oriented, creative and strong. We each had chosen our career path because it suited our talents and fired our passion, not in pursuit of celebrity. I'm no longer positive where you are getting your info, but great topic. I must spend some time studying more or working out more. Thank you for wonderful information I was on the lookout for this information for my mission.